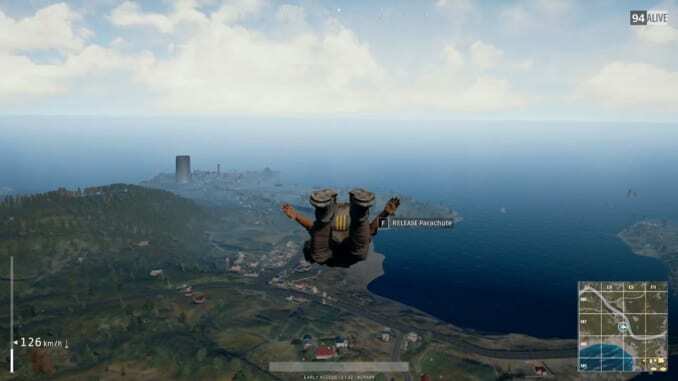 This article contains information about the Battle Area and explains how it works in PlayerUnknown's Battlegrounds [PUBG]. Upon entering the Battle Arena, the player drops from the plane. As they descend down, a large white circle soon encircles the area. Once it does, a blue circle appears and closes gradually in on the white circle. The blue circle marks the area in which the player cannot step. Players who do so will suffer incrementally increasing pulse damage. The longer the player stays beyond the remaining area, the more frequently he takes damage from the pulse. The table below displays the amount of damage taken for every pulse. The pulse damage occurs when the player gets out of the safe area. Unlike other games, it does not leave the player with 1 remaining HP; it is possible to die purely to pulse damage. As time passes, the area will soon reduce in size. As the area reduces, so will the playable area. When the playable area shrinks, players will have no choice but to engage. There are certain times when the battle area will begin shrinking and a specific amount of time to move on to the next area. The game will indicate how far you are from the blue line, and how long until the area begins shrinking again. The Red Area is the place where a bombing will occur. Any player caught within the area will be obliterated. However, there are ways to avoid the bombing, such as hiding in houses. While hiding in a house, stay away from any windows and doors which also inflict damage on the player if within range. Also, if the house is made of wood, it will only withstand 1-2 barrages before leaving the player vulnerable to the bombing.